SDC International Moving Company is your best option when relocating from USA to Europe, Asia and worldwide. SDC International Movers offers Household Moving from your home door to your new home in a far away country. 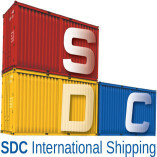 SDC International Moving Company will assist in everything from packing, through costums and more.